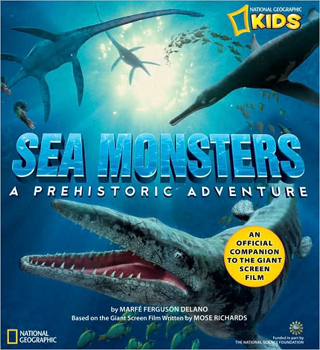 Relive the wonder of “Sea Monsters,” National Geographic’s 3-D Large Format Film, and learn more about these weird prehistoric creatures of the deep with this Official Children’s Companion Book to the giant-screen film. Sea Monsters leads kids into the Late Cretaceous Era, 80 million years ago. Stunning images of giant sharks, enormous squids, massive marine reptiles, and flying creatures with razor-sharp teeth will thrill young imaginations. Follow the story of a marine reptile called Dolichorhynchops—Dolly for short—as she braves the dangers of her inland sea home. Enjoy the cool digitally generated images of creatures like Tylosaurus, a whale-size predator, and the long-necked Styxosaurus.